We begin with covering some additional information on Recordset options, record locking, types, counts, and so on. You will learn about the Seek method, which is similar to Find, but faster and more efficient, although it does have some limitations. You'll learn about the CancelUpdate method. You'll learn how to use the OpenDatabase command to work with ANY database file, not necessarily just the currently open database. You'll learn about the Fields collection, and how to loop through all of the fields in a recordset using the For Each method. You'll also learn how to determine the type of data that is stored in each field. 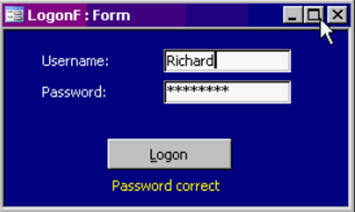 Next we'll have some fun by creating our own secure user logon for our database. I personally don't like Access' built in security, so I've built my own. I'll also show you how to create your own LogIt function to track everything every user does in your database. OnDoubleClick - Which Is Selected? Harry Mullin on 3/5/2009: General Access question - the default indent spacing in code window does not match the tab setting. Hence, wizard created code will set its indents at a different place than hand typed code using the tab key or indent button. How can the two be sync'd? Richard Rost on 3/6/2009: Harry, in the VB EDITOR go to Tools > Options and on the Editor tab you'll see "Tab Width" which is where you can specify the size of your tabs (4 characters is the default). Harry Mullin on 3/6/2009: I have a form whose record source is a query and it is filtered by a Primary Key. I'm using an UPDATE SQL statement to add information to a field (can't do it directly as the query won't allow edits (Totals are on). When I .requery the form, the filter goes away and other data appears. Is there a way around this? Is there a way to review all comments for a group of lessons (eg Advanced Recordsets) without worrying about which specific lesson one is in? I got your comments back on my questions, but now can't find them easily. Richard Rost on 3/9/2009: Harry, instead of using a filter, change the RecordSource of the form with a dynamic SQL statement like I show in Access 311 (Dynamic SQL Form). Personally, I hate filter. They work for VERY basic criteria only. Richard Rost on 3/9/2009: Harry, go to the page on my web site for that course. At the very bottom of the course description/outline you'll find ALL of the student comments (and my replies) for the entire course. For example, Access 322 is at http://www.599cd.com/site/courselist/access/access322. You can also find it by clicking on the COURSES link on the main menu of the web site. Courses > Microsoft > Access > 322. Thought maybe that bit might help. Richard Rost on 5/27/2009: Bryan, thanks for the update. 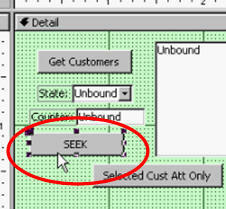 I don't have SQL Server 2005 Express here, so I would have never caught that. Apparently the username is getting set to the username field but the password is not getting set to the password field. Richard Rost on 10/2/2009: Ray, your SQL code looks fine. Check your field names and make sure they match your form fields exactly. This is usually caused by a misspelling of field name. a wildcard in the DAO seek method?I mean instead of choosing 5 I can choose any other value without changing it in the code. Sure. I put in a "5" just as an example. You could substitute a variable or a form field there if you want to. David Richardson on 5/6/2010: My last question was partially answered. I do not recall which video I was watch, but you have hovered over the control and the full name appeared. How does the full name gets displayed by hoveering over the control? David, look for the Control Tip Text property. Whatever you put in there will appear when you hover over the control. CurrentUserLabel.Caption = "Good Morning " & CurrentUserName & "!" CurrentUserLabel.Caption = "Good Afternoon " & CurrentUserName & "!" CurrentUserLabel.Caption = "Good Evening " & CurrentUserName & "!" Doesn't it look cool? Probably the Select Case statement or Elseif would look cooler. You have been very quiet of late. I noticed you approved our comments. Thank you. However, some of the comments were questions and we were expecting some form of expert answer from you. Your replies are however not visible. Would you be kind and reset to VISIBLE or write the responses again? Micah, sorry ive been absent lately. Im working on a big project that is taking all of my time. I have marked many of your questions to follow up on and I will answer them as soon as I can. Kenya on 10/5/2010: Hi Richard, I have purchased a few of your lessons and I love them, you have saved my job on many occasion. THANKS...I have recently run into a problem with autoexec, the module is set up to allow the full Access menu's when certain users are logging in but the problem is when the auto exec crashed it locked everyone out of the database. We were unable to access any of the menus to check the code of the macro or to remove it. How can I prevent this from happening again or is there another way to block my database menus without running a macro? Hold the SHIFT key down and restart your database. This will bypass your startup macro and let you get to the database window to figure out what's wrong. Lilly Nguyen on 4/9/2011: Do you have any course that teach how to create Access for multi users? I have talked about it briefly in several of my courses, but it's not that difficult. You just need to set up a SHARED FOLDER on your network that everyone has read/write access to. Then place your database there. However, keep in mind it's not really secure. I talk about this in great depth in my Access Security Seminar. Please help - clicking logon button brings Compile Error: variable not defined. Followed everything in video - I thought.